Come and enjoy everything this fully-loaded cabin 'Night Sky' on Norris Lake has to offer. Located in prestigious Lakeside Estates gated community. 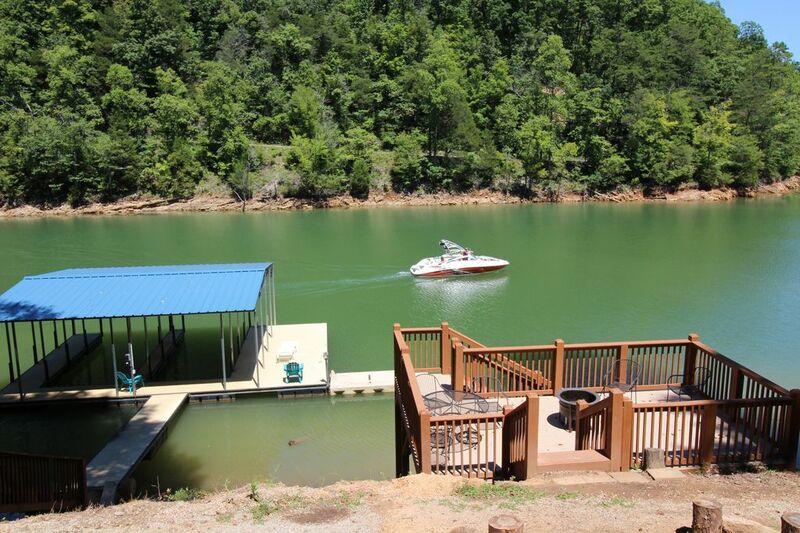 Let the kids wakeboard/water-ski all day while you relax from one of the four lake-view decks. Or chill in your own 6-person personal hot-tub on the second level deck. ***The hot tub water is changed prior to your arrival***. Park your boat in the personal covered boat dock directly in front of your cabin. No boat? No worries! Nearby Sugar Hollow marina or Shanghai Resort offer daily/weekly boat rentals. Or simply have Oasis Watersports deliver a watercraft right to Night Sky's dock. John Bertke lives in Dayton, OH and enjoys visiting Norris with his friends and family. He enjoys fishing and smoking cigars. They say 'location' means everything. "Night Sky" is 7 minutes from LaFollette, 5 minutes from the main road, inside a gated community, nestled in trees, right on the water's edge. I'm an avid fly fisher, my wife loves to golf, and my daughters never tire from wakeboarding so my whole family stays happy when we visit "Night Sky" cabin on Norris Lake. Cabin is strategically located in direct view of the wildly popular "Jump's Bridge"
Two refrigerators. One in kitchen, one on lower level. pub style table seats 8. kitchen bar with 3 stools. 3 total TVs with satellite. Sports and premium channels included. All deck levels are balconies. Triple-level deck, all levels overlooking lake. Free community pool located just up the street. Contact owner about important logistics details. Dock features swim platform, lights, outlets, 2 covered slips, 2 outside slips, 2 PWC docks. Exclusive >>>> we change the hot tub water prior to your arrival. Giant propane tank feeds your grill ensuring you're never empty. Night Sky cabin at Norris Lake is the perfect place to gather with your friends and family with plenty of space and things to do. A quiet Cove a beautiful view and a lot of fun. The house was very functional and contained all items needed for our family. Great location . We had a good time. We had good time, but the heater doesn’t work good. It was very cold in the basement, and the room they have with 2 twins bed upstairs, it is very small, we can not count like a room. The house is good . This house has some nice amenities that our group enjoyed (projector TV, arcade game, hot tub, dock). We had 11 adults and 9 children and fit comfortably with one family/couple per room. A couple additional things to bring that weren't on the list: hand soap (none in any of the bathrooms), bath mats or extra towels to use as bath mats, ice or cube trays (the upstairs freezer ice maker doesn't work), extra hand towels for washing/drying dishes, forks (there are plenty of plates, dozens, only a dozen or so forks though so we just let the kids eat first then washed them all so the adults would have enough). I'd also recommend not choosing this location if you have a severe bee allergy, it may have been the unseasonably warm weather but there were a lot of red wasps on the stairs going down to the lake and a nest on the upper deck. We just told the kids not to go out onto the upper deck as red wasps do get aggressive. Might be worth bringing wasp/hornet killer just in case. Not sure how often the trash gets picked up but the cans were nearly full and the previous renters weren't very clean at all and had dumped a lot of loose trash in so there were a lot of bees and flies (they had also left a bunch of cardboard by the fire pit, we tried to use some of it). Double check the gate code before you arrive, the one we were given was apparently pretty old and there's no cell service at the gate but fortunately someone else was leaving and gave us the new one. Finally, be careful leaving, after acting strangely when I was leaving (it acted like it was going to close on our car but bounced back), the gate closed on one of our friends vehicles and tore down the side of their truck, not an ideal ending to an otherwise fun weekend. Always a great quality family time!!! Night Sky is kept up very nice, and we have stayed here multiple times. I would strongly recommend anybody to stay here.